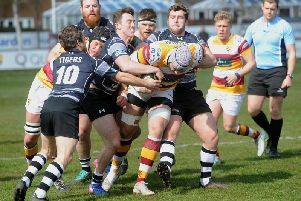 Fylde’s Alex Loney believed his players were unlucky not to take more from Saturday’s 31-15 defeat at Rosslyn Park. Loney, who led the coaching on the day in the absence of head coach Warren Spragg said: “We were happy with how the boys prepared leading up to this game and we were confident of putting in a decent performance. In many ways, we did! “However, I felt we could have won more collisions between the 22s and some key moments probably swung the momentum of the game. “Overall, Rosslyn Park deserved their victory. Looking ahead, the whole squad feel energised for a tough home game against Ampthill. Spragg, who missed the game because of Sale Sharks commitments, added: “Although the last few weeks have been frustrating with being at Academy Under-18 matches, it has been a great opportunity for Alex and Dan (Orwin) to step up and gain experience of leading the team on match day. “Whilst the short term results haven’t gone our way, I am pleased with how we are developing as a coaching team and with the way they have handled the responsibility. “There are a limited number of coaches with this type of experience in the North West.